In 1933, Clair Omar Musser, who was at that time an employee of the J. C. Deagan Company, assembled a group of 100 musicians to perform as a “marimba orchestra” on the steps of the Hall of Science building for the Chicago World’s Fair. The World’s Fair Marimba Band performed two concerts a day from August 19 to August 26, 1933, for this Century of Progress celebration of the city of Chicago. For these performances, Musser designed a unique Century of Progress marimba that was symmetrical in appearance in keeping with the art deco designs utilized throughout the fair. 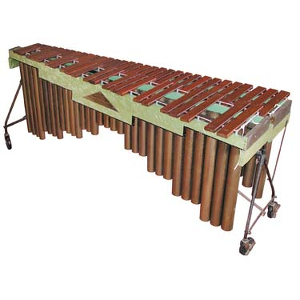 Decorated in green “mother of pearl,” the 100 marimbas were built for and purchased by their designated players, each one being labeled with a triangular plaque bearing the player’s name. Of the 100 instruments, 25 had a range of 4 1/2 octaves (c-f) and 75 had a range of 3 1/2 octaves (f-c), each of which were purchased for $500 or $350, respectively. This instrument, built for Rudolph Robert Willmann, is serial number 55 with a range of 4 1/2 octaves (C3–F7). The frame stands 36” tall at the accidentals rail and measures 88” in length. The bars range from 18 1/2” x 2 1/2” x 1” to 7 13/16” x 2” x 15/16”, with slight deviations in the thickness of the natural bars. 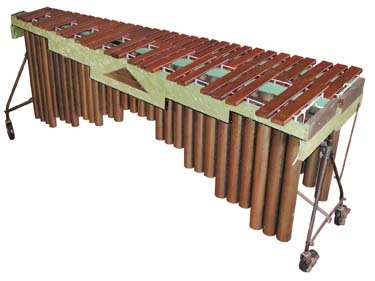 The symmetrically designed, art deco resonatorsThe metal pipes that extend below the bars on a marimba, xylophone, or vibraphone. They carry t..., which split apart for transportation, range in length from 15-1/2” in the middle to 31-1/2” on each side.